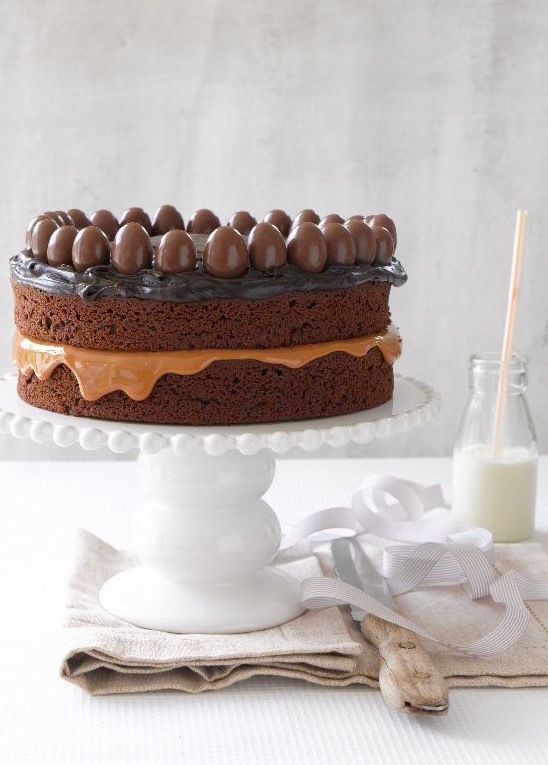 This spectacular cake is simple to make and assemble and wonderfully delectable to eat. I find Scorched almonds are an easy, effective and delicious decoration. 1 Preheat oven to 180°C. Grease two 20cm springform cake tins; line bases with baking paper. Place butter, chocolate and milk in a bowl set over a saucepan one-quarter full of simmering water until melted. Or microwave, to melt. Add sugar and stir until smooth. 2 Remove from heat to cool slightly. Stir in vanilla, egg yolks and sour cream, followed by flour and baking powder. Whisk egg whites in a clean bowl until stiff peaks form. Gently fold egg whites into cake mixture. 3 Divide mixture between prepared tins. Bake for 30 minutes or until firm to touch. Remove and transfer to a wire rack to cool completely. 4 Make ganache by melting chocolate and cream together in a bowl. Stir until smooth. To assemble, sandwich cakes together with caramel. Spread ganache over top of cake and decorate with Scorched almonds. This entry was posted on September 11, 2017 by julie.